For chronic pancreatitics who have a glandular morphology characterized by a dilated main pancreatic duct, pain is thought to be due to ductal hypertension and glandular/capsular stretch. Decompression of the pancreatic duct by either endoscopic transampullary stenting or surgical drainage is the principle method of treating symptoms in these patients. Surgical intervention is commonly thought to carry increased risk of perioperative morbidity, thus current practice involves an intervention sequence starting with endoscopic stenting and falling back to surgery in cases of recalcitrant pain. There is, however, little evidence to argue that an “endoscopy first” approach is better than early surgical intervention. Few studies prospectively examine outcomes of endoscopy compared to surgery in terms of pain relief, morbidity and mortality, number of repeated interventions, and preservation of pancreatic function. The evidence that is available suggests surgical management of large duct chronic pancreatitis results in better long term outcomes when compared to endoscopic therapy without incurring prohibitive risk of significant perioperative morbidity. 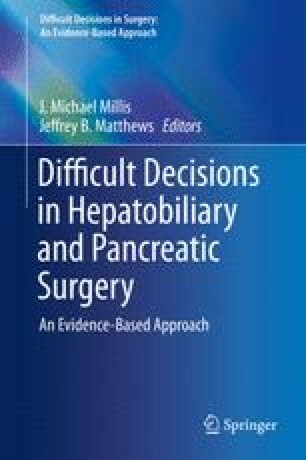 In our view, surgical drainage of the pancreas should be considered as a primary method of managing patients with chronic pancreatitis and a dilated main pancreatic duct. Ali Ahmed UA, Pahlplatz JM, Nealon WH, et al. Endoscopic or surgical intervention for painful obstructive chronic pancreatitis (review). Cochrane Libr. 2012;(1):CD007884. doi: 10.1002/14651858.CD007884.pub2.